A new education package will help General Practitioners, Practice Nurses and patients raise the topic of nutrition during consultations, offering the opportunity to significantly improve poor diet, which is the most prevalent modifiable risk factor for chronic disease in Australia. The NutriCare program was developed by a team of 9 leading researchers in Australia, led by Dr Lauren Ball through her NHMRC Research Fellowship. Researcher backgrounds include general practice, medicine, nursing, nutrition & dietetics, public health, epidemiology, statistics and health economics. "Australians have poor diets," said Dr Ball. "Most people do not follow the Australian Dietary Guidelines, endorsed by the National Health and Medical Research Council (NHMRC). "Clearly, the way we eat is a significant health and economic concern that warrants urgent intervention. "Our team has shown that adults highly value discussions about nutrition during the ongoing care they receive from GPs and PNs and want to be asked about diet, provided with nutrition advice and/or referred to specialised health professionals such as dietitians. "We have demonstrated that GPs and PNs are effective at improving patients’ diets when they discuss nutrition, including reducing intakes of discretionary foods, eating more fruit and vegetables and reducing diet-related disease risk. "Discussing nutrition with patients should be commonplace in general practice." But Dr Ball said most patients did not discuss nutrition with their GP or PN, with discussions taking place in less than 7% of consultations. "Less than 37% of people with a poor diet remember ever discussing nutrition with a GP or PN and many report feeling unheard and rushed when wanting to do so. The SNAP (Smoking, Nutrition, Alcohol, Physical Activity) practice guidelines already provide a model for how GPs and PNs can discuss nutrition with patients, however practitioners had indicated that they want support to start the conversation. NutriCare's goal is to help start such conversations. "Evolution within the health care system has created significant barriers to GPs and PNs discussing nutrition with patients. "We have found that GPs and PNs feel they have insufficient nutrition knowledge, report low self-efficacy in nutrition and are faced with competing priorities in consultations. "Facilitating GPs and PNs to talk to patients about nutrition may appear to be a simple task, however, conventional strategies have had limited success in their uptake because they vary in their effectiveness, cost and sustainability." NutriCare is a theoretically grounded program, modelled on the Theoretical Domains Framework (TDF), which provides a method for theorising how to change health professional behaviours and has been extensively used and validated for health services research. 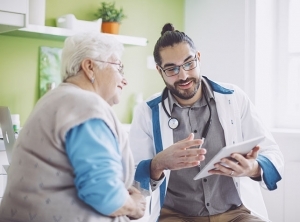 “The NutriCare intervention has six components that concurrently facilitate GPs, PNs and patients to raise the topic of nutrition during consultations. “Three components target adult patients before attending consultations and three components target GPs and PNs in clinics. Dr Ball said the goal is for the NutriCare program to be scaled-up to all clinics throughout Australia. “The resources are purposefully simple and low-cost, increasing the likelihood of findings being effectively translated into practice.